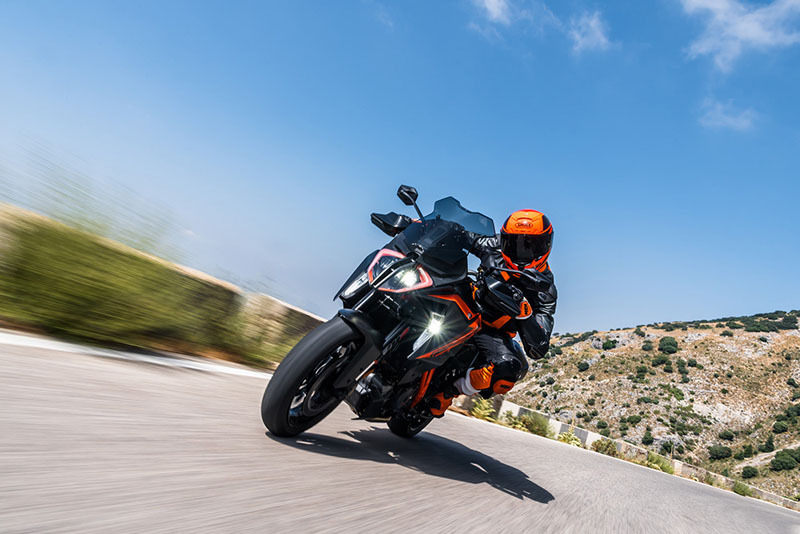 The 2019 KTM 1290 SUPER DUKE GT takes the already-proven long-distance performance of the previous GT model and amplifies it even further with added improvements. The same deranged combination that the previous SUPER DUKE GT had of THE BEAST's interstellar V-twin performance with the comfort and equipment needed for all-day, two-up charging - but now intensified with additional enhancements, refinements and new features which further boost performance, while adding to its long-distance hunting skills. BODYWORK & GRAPHICS: Designed to devour unlimited kilometres with optimum wind and weather protection, the KTM 1290 SUPER DUKE GT is a bona fide grand tourer. New tank side panels, with storing compartments and USB charging hub, add to the KTM 1290 SUPER DUKE GT’s state-of-the-art finishing. It’s definitely one of a kind. BODYWORK: An all-new headlight mask and redesigned screen. INTEGRATED PANNIER MOUNTING: Hard case panniers are offered as KTM PowerParts can be easily fitted to the integrated mounting system of the motorcycle, while keeping the sporty look and unique style of the motorcycle. Remove the panniers in an instant, and instantly be badass. LED CORNERING LIGHTS: The KTM 1290 SUPER DUKE GT has cornering lights integrated into its fuel tank. These consist of three LED segments, using the lean angle sensor of the MSC system as a trigger. Depending on the lean angle, the KTM cornering light can use up to all three segments, always giving the rider the perfect view to where he/she is going. Integrated in the cornering lights are also LED indicators, which give the KTM 12090 SUPER DUKE GT a unique and exclusive look. 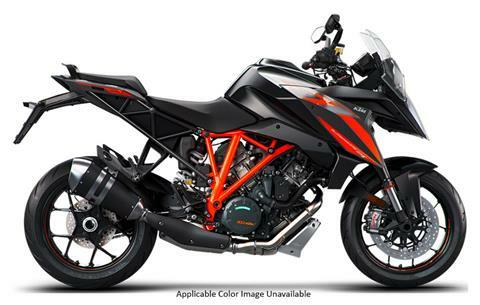 DASHBOARD: The KTM 1290 SUPER DUKE GT gets a full color, tilt-adjustable 6.5” TFT Dashboard, derived from fellow stablemate, the 1290 SUPER ADVENTURE. This gives riders a full view into all information pertaining to the motorcycle, from ride modes to turn-by-turn navigation via KTM MY RIDE. The display layout has also been newly designed for the 1290 SUPER DUKE GT and finds the right balance between information and style. Oh, and have we mentioned that it’s an award-winning device? CHASSIS: The KTM 1290 SUPER DUKE GT’s chassis is a high-tech wonder. The challenge: house the immense V-twin power without compromising high-performance, long-distance capabilities, both on track or public roads. Using high-end components and cutting-edge technology, the almost impossible balancing task needed to create the GT was achieved thanks to complex chassis modelling, development and construction processes and technologies. FRAME: The hint is in the name. The KTM 1290 SUPER DUKE GT is built for covering ground quickly and comfortably. Thanks to its refined ergonomics, electronically adjustable suspension and impressive tank range, the SUPER DUKE GT is the perfect travel companion. 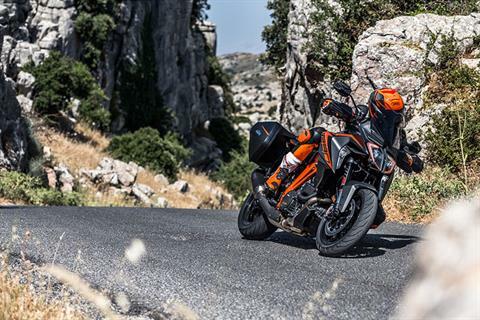 SUBFRAME: Engineered to support a pillion, as well as full-loaded panniers, the subfame on the KTM 1290 SUPER DUKE GT ticks a number of key hyper-touring boxes. SWINGARM: The single-sided swingarm on the KTM 1290 SUPER DUKE GT is not only the lightest in its class, but also meticulously manufactured and generously dimensioned - a reassuring nod to spirited long distance travel. ENGINE & EXHAUST: There’s no replacement for sheer displacement! Based on the advanced 1301 cc engine of the KTM 1290 SUPER DUKE R, the KTM 1290 SUPER DUKE GT is clearly the Alpha within its segment. Featuring updates like titanium inlet valves and revised resonator chambers, this V-Twin packs a powerfully smooth punch. For fully-loaded tours, massive torque from the bottom up means there is less need for extensive gearshifts. Better yet, all this torque means mountain passes are easily dispatched even when fully loaded with a passenger. ENGINE: The KTM 1290 SUPER DUKE GT’s BEAST-derived powerplant perfectly fits its sovereign appearance. With 175 hp and 141 Nm of torque, it’s as much a superbike slayer as it is a coastal road cruiser. A unique mix of the highest quality components, such as titanium inlet valves, have also combined to create overall reliability and allowing for service intervals of 15,000 km. That’s a lot of touring! CYLINDER HEAD: An absolutely key element in the outstanding performance and smooth response of the 1,301 cc 75° V-twin are the unit’s cutting-edge four-valve cylinder heads. These combine twin-plug ignition, flow-optimized ports, lightweight titanium valves and resonator chambers for the smoothest twin in town. MAPPING: When you’re traveling two-up, the last thing you want is a jerky throttle. KTM have worked the EFI mapping, in combination with the plain bearing and timing, to transfer low-down power to the road with less vibration and reduced engine noise. CRANKSHAFT: The responsiveness and free-revving nature of the KTM 1290 SUPER DUKE GT's engine is thanks to the low reciprocating weight of its crankshaft. TWIN IGNITION: The twin-plug ignition system controls two differently sized spark plugs in each cylinder head independently of each other in such a way that more efficient combustion and a smoother, optimally controlled combustion sequence are achieved at all times. The result: more power, better control, lower fuel consumption and lower emissions. RIDE-BY-WIRE: The Ride-By-Wire system on the KTM 1290 SUPER DUKE GT goes the extra mile. By electronically translating throttle commands into optimum throttle valve positions for the current riding situation, it processes throttle twist grip movements with the help of electronic sensors and activates the throttle valves accordingly using servo motors. This means smoother throttle response, reducing the chances of low-rev jolting and involuntary wheelies. Voluntary front wheel antics however, could easily be a thing of your future. SLIPPER CLUTCH: Not only does the slipper clutch open when the engine back-torque becomes too high, it also assists when you open up the throttle. The former prevents destabilizing rear wheel chatter when braking sharply or decelerating; the latter reduces the hand force required for changing gear, allowing the clutch to be controlled with one trigger happy finger. 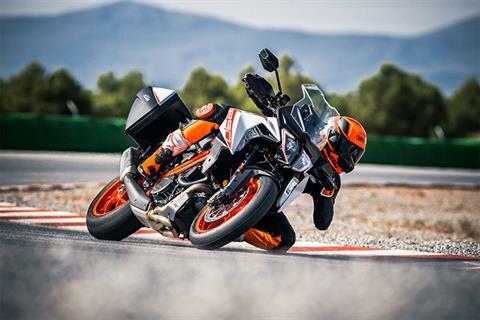 PISTONS: We borrowed Formula 1 technology in creating the pistons in the KTM 1290 SUPER DUKE GT. The forged piston structure on the KTM 1290 SUPER DUKE GT, results in a high loading capacity, despite the extremely short and lightweight design. Furthermore, the piston skirts have a state-of-the-art, hard-anodized finish. Not only does this reduce friction, it is also particularly hard-wearing with a consequently a positive impact on durability. EXHAUST: The KTM 1290 SUPER DUKE GT's exhaust system is made entirely from rustproof stainless steel and is Euro IV homologated. Hundreds of test bench runs and complex simulations ensured that the exhaust system, which is using an exhaust flap, contributes decisively to the extremely smooth torque curve and excellent emission values of the powerful twin-cylinder. And did we mention the sound? While it whispers at low revs, it will take your breath away reaching for the high notes. ERGONOMICS & COMFORT: Fit for purpose. The KTM 1290 SUPER DUKE GT concept of long-distance performance riding would never succeed if it could not balance high-performance riding with long-distance comfort. To achieve this, the GT is designed for ease of movement and simple adjustability while piloting the bike. Add in the flexibility needed to cater to either one or two riders and you’ll understand what makes the GT the ultimate long-distance cruise missile. HANDLEVERS: The brake and clutch levers can be adjusted in several positions, allowing riders to find that sweet spot of comfort and control. MODE SWITCH: The on-board computer's menu pages are selected and operated using the four control keys of the mode switch on the left handlebar grip. It's very simple and intuitive: "up" and "down" scroll through the menu, the left button selects the desired item, the right confirms it. The Exit key on the left of the mode switch can be pressed at any time to return to the previous menu level. Child’s play, basically. SOFTWARE & ELECTRONICS: Keeping the KTM 1290 SUPER DUKE GT under total control while you exploit its full potential - that's what the unique electronics package of this motorcycle allows. Lean-angle sensitive electronics intervene to provide maximum grip and optimum traction under braking or acceleration – letting you hunt horizons and chase superbikes with confidence. MSC (MOTORCYCLE STABILITY CONTROL) WITH C-ABS: The ultimate in safe deceleration. One component of the comprehensive BOSCH MSC assistance package is the lean-angle sensitive cornering ABS. Based on the high-quality 9ME modulator, it unites the talents of combined front and rear wheel braking and lightning-quick, efficient pressure modulation with the high quality Brembo hardware to make the most advanced braking system on the market - no-one brakes more progressively or safely, even at extreme lean angles. TPMS (TIRE PRESSURE MONITORING SYSTEM): As its name implies, the TPMS monitors tire pressure, and gives you a view of current pressures in the TFT display. In the event of sudden loss of pressure, for example due to tire damage, a warning will alert the rider on the dash. SUPERMOTO MODE: The GT is still part of the DUKE family. With that in mind, we have carried over Supermoto Mode to allow keen riders to lock the rear wheel with ABS staying active on the front wheel - a prerequisite for committed cornering with the rear wheel screeching in delight. ATIR (AUTOMATIC TURN INDICATOR RESET): After 10 seconds of movement and 150 meters of riding distance, the turn indicator will stop automatically. If pressed again during longer waits at an intersection, it counts from zero again. A big improvement in terms of safety, as it is now impossible to forget to reset the indicators. MTC (MOTORCYCLE TRACTION CONTROL): The MTC (Motorcycle Traction Control) lean-angle sensitive traction control system reacts immediately if the rotational speed of the rear wheel is disproportionate to the riding situation. In a matter of milliseconds, MTC reduces the engine output with an extremely smooth, barely perceptible intervention at the throttle valves, until the system has reduced slippage to optimum proportions for the selected ride mode and current angle of lean. Depending on the selected riding mode, MTC traction control allows different levels of traction slip at the rear wheel. In "Street" mode somewhat more than in "Rain" mode, while slight power slides are allowed when exiting curves in "Sport" mode. All this means that the rider can concentrate on the run of the road and other road users – the guarantee for maximum performance and ultimate riding pleasure, but also a decisive contribution to active safety. For particularly ambitious riders, who feel like enjoying the breathtaking propulsion of the KTM 1290 SUPER DUKE GT without any electronic assistance, the traction control can also be switched off. 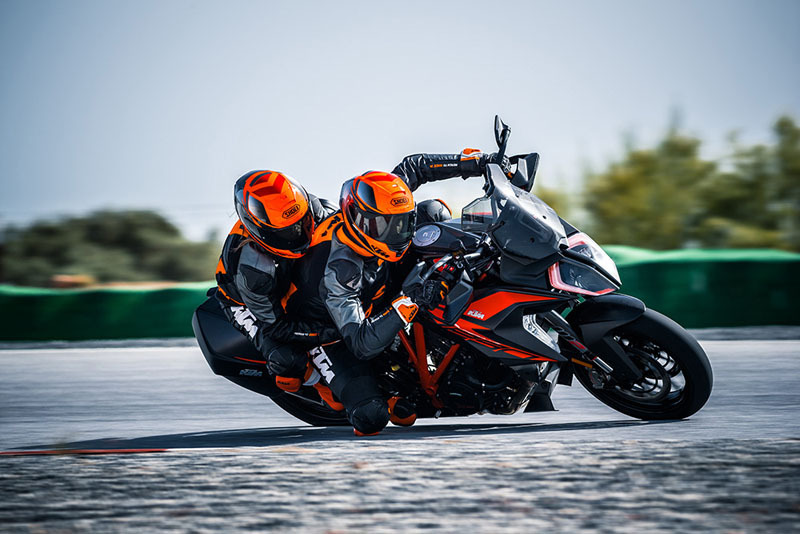 QUICKSHIFTER: The KTM 1290 SUPER DUKE GT is equipped with a race-derived Quickshifter+ with allows for up and down shifts without using the clutch. It reads and responds to your riding, so the shift action is as fast as you are. CRUISE CONTROL: Long motorway journeys are made even easier with the KTM 1290 SUPER DUKE GT’s standard cruise control. Switches on the left side of the handlebar and a display in the TFT dashboard allow the rider to intuitively set and change the requested speed, so you’ll arrive at the fun bits with energy to spare.